There are two ways of listening to music: you can shut everything out and focus purely on the tunes, or you can use music to enhance other activities in your life. Headphones and earbuds, especially those of the noise-cancelling variety, are quite good at first; you just put some on, turn up the volume, and let everything else fade away. However, when it comes to the second kind of enjoyment of tunes, earbuds aren’t quite as proficient. Now sometimes that’s a good thing, because I doubt many people like hearing others grunt at the gym or taking a jackhammer to the street. But at the same time, wearing earbuds often means you lose the ability to hear the bell of a bike coming up from behind you, or the chirping of birds on a beautiful day in the park. That’s precisely where Sony’s new Xperia Ear Duo headphones come in. By using earbuds with a hole in the middle and an innovative audio driver that sits behind your ear and pipes sound down a long tube (rather than the driver sitting right in or on your ear), Sony has created a truly unique listening experience that lets you hear ambient noise and music, podcasts, or whatever without isolating you from the rest of the world. And that’s including devices with pass-through audio like Bragi’s Dash Pro earbuds, or things like the Airpods, which allow sound to trickle in around the sides of the earbud. The best way I can describe it is that wearing the Ear Duo makes it feel like you’re in a movie. You’ve got the perfect music on in the ground—because you picked it out—but you can also hear the rustle of leaves swaying in the wind, or the faint crash of ocean waves in the distance. And as niche as this might sound, using the Ear Duo is the best way to listen to music when you’re walking around on a nice day or navigating busy streets on a bike. It’s almost like there’s someone following you around while playing your favourite songs on a boombox. And when you want to stop off in a store for a snack or something, you don’t need to go through the rigmarole of taking your earbuds out just so you can make an order. It’s situations like this that highlight the second best thing about the Xperia Ear Duo. When you want to have a conversation, you don’t have to stop the music to do so—just talk normally let the other person’s responses blend in with the music. It’s never distracting or confusing and it also makes the Ear Duo the perfect device for listening to music in the office while getting work done. And if someone calls your phone, the Ear Duo can handle that too. 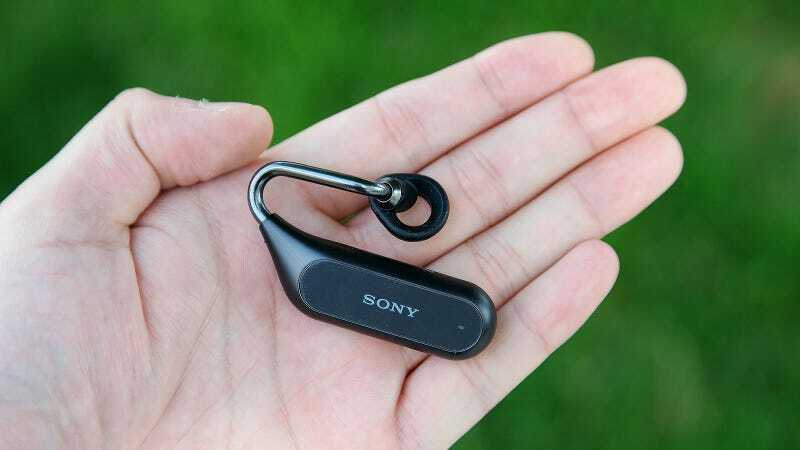 As for the device itself, the Ear Duo doesn’t suffer from the dropped connections you get on some other Bluetooth earbuds, while also mostly living up to Sony’s battery claims that the buds last four hours on a charge. And while it might sound strange, sound quality is simply good, not great. 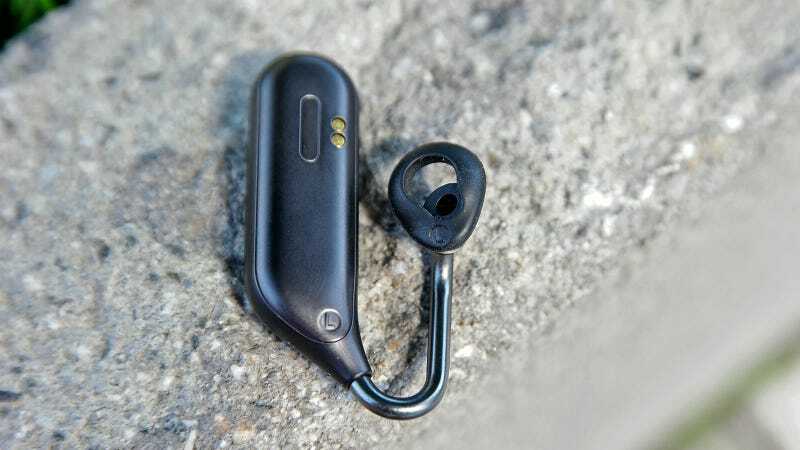 Due to the Duo’s open-air design, the earbuds function more like tiny speakers than headphones with drivers pumping sound straight into your heard. This makes bass sound somewhat distant, and sometimes I found myself wishing max volume was a little louder. To adjust the volume there are touch controls built into the sides of each bud. And they allow you to skips track and even take calls without pulling out your phone, too. The Ear Duo also comes with a dedicated app (available on Android and iOS), which makes it so that the earbuds connect to your phone as soon as you take them out of their charging case, and gives the Ear Duo its own digital assistant that can recap the day’s news, remind you about upcoming calendar events, and even tell you how many calls you missed. It’s a neat little trick, but between the assistant’s robotic voice and Google and Apple’s already deep ties into people’s phones, having yet another digital helper feels somewhat superfluous. The Ear Duo’s drivers are in the pod, which sends music down the tube and into your ears, while the opening in the ear pads let in unobstructed ambient sound. Unfortunately, because the Ear Duo goes out of its way to let the world in, there are a number of situations where that pro can turn quickly into a con. For example, if you’re waiting for the subway, these things are practically useless, and without any sort of noise-block or cancellation, trying put pump the volume loud enough to overcome the squealing of train brakes would make you deaf. Then, even after you get on the train, listening to things like podcasts is still quite difficult. When you’re walking down the street, the sound of traffic adds to the atmosphere; that is, until a police siren or fire truck comes roaring by determined to give you a headache. When they are on, the touch controls built into the earbuds can be used to control your music, answer phone calls and more. The other major struggle with the Ear Duo is simply getting them on. You kind of have to thread your earlobes into that U-shaped gap to get things seated properly; a process that’s even more difficult if you happen to be wearing earrings. Once you do finally get them on, there’s still a bit of wiggle. And while I never had problems with them falling off—either normally or while running—I definitely wouldn’t call these workout ready unless you’re on a bike or something. The included battery case has enough juice for three full recharges. After more than two weeks of wearing the Ear Duo every day, I’m terribly conflicted. When everything is set up just right, they are hands-down my favourite way of listening to music on the go. They are perfect for walks, jogs, or bike rides where you want to listen to music without having to lose awareness of your surroundings. 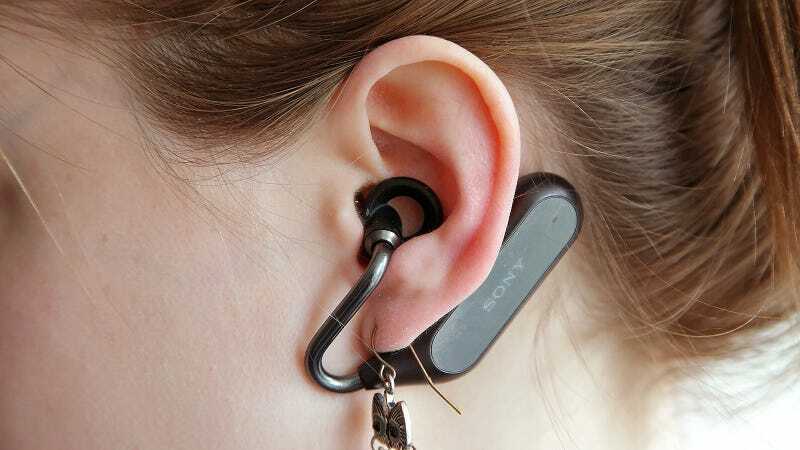 But at the same time, Sony’s innovative earbuds are incredibly niche. They are rubbish in noisy environments, relatively annoying to put on, and then there’s the price: £249. That’s a lot of money for any pair of Bluetooth earbuds, let alone ones as specialised as these. Even if you can ignore all those flaws, the Ear Duo is hard to justify, and even harder to recommend. That’s a really big disappointment, because I love the idea, and using them can make even the most ordinary events feel a bit more special. Here’s hoping Sony doesn’t give up, because with a little refinement, this concept could be great. The Ear Duo excel at two situations: quiet offices where you still might want to hear if something is talking to you, and leisurely walks in the park. 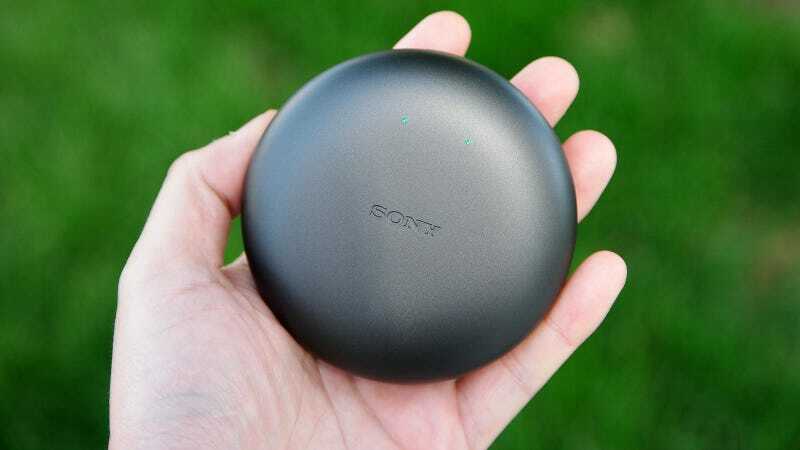 Battery life isn’t far off of Sony’s stated claims of four hours on a charge, with another 3 full recharges coming from the battery case. The Xperia Duo listening experience isn’t like any other set or earbud around, even ones with pass-through audio. They are damn near useless in noisy environment like train stations or near construction.